An understanding of the anatomy of the ear can help to understand how hearing works and how hearing loss occurs. The ear is split into three sections: the outer, middle and inner ear. The pinna and the ear canal funnel and direct sound pressure waves into the middle ear. The eardrum (or tympanic membrane) turns sound into vibrations. These vibrations then pass through a chain of three tiny bones (the ossicles) and into the inner ear. The inner ear includes the vestibular system (dedicated to the control of balance and posture) and the cochlea. The spiral-shaped cochlea is dedicated to hearing. It is filled with fluid (perilymph) and lined with sensory cells known as outer and inner hair cells. Vibrations from the middle ear are converted into fluid waves in the perilymph which are sharpened and amplified by the outer hair cells. This signal is then received by the inner hair cells which send it on to the brain via the auditory nerve. Therefore, the inner and outer hair cells and the neurons of the auditory nerve are absolutely critical to the hearing process. If these cells are damaged and die, the body cannot replace them with new cells. When a hair cell or neuron dies, it is gone for good and a link in the hearing process is irrevocably destroyed. 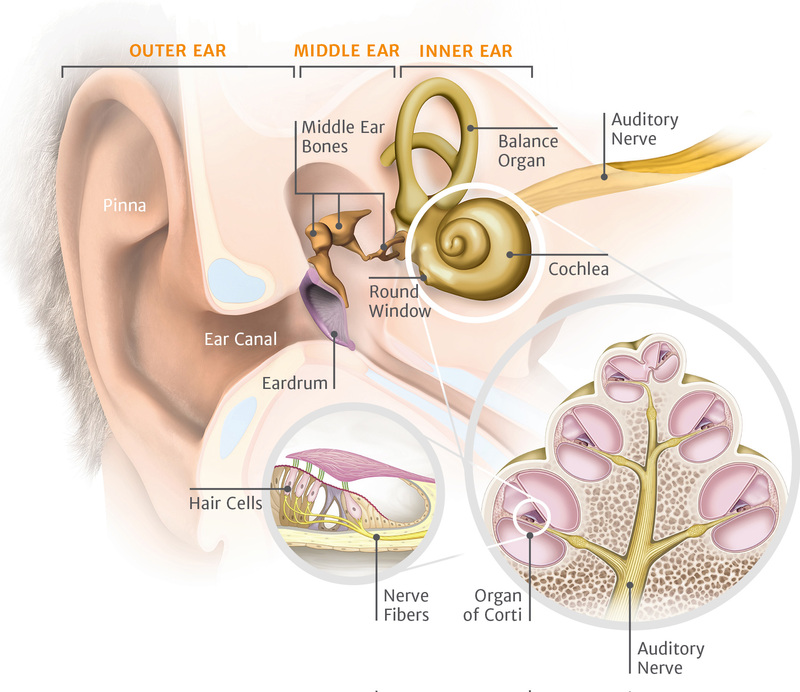 Hearing loss due to damage to the sensory cells (hair cells) of the cochlea or to the nerve pathways from the inner ear to the brain is known as sensorineural hearing loss (SNHL) and accounts for up to 90% of all hearing losses.